We have added another virtual tour provider to the RealEstateOne.net site. Real Tour Vision technology comes highly recommended from our agents that have tried them. Their prices are great and they do stills also and post them to the web for you. Choose the link below to access their online order page. This link is also located under the Product Ordering section of the http://www.realestateone.net/ site. Also, just a reminder, CirclePix virtual tours have increased to $70 for a 5 scene virtual tour! This blog is a press release from Real Estate One. Pricing and services pertain only to Real Estate One. Attention Real Estate agents and in-house providers! Get your planners out and mark this date. On Wednesday, Dec 12th 2007, Michelle Spalding, CEO and Founder of Transaction Management Consultants, will be revealing the inner workings of how to simplify and streamline the entire real estate process and give yourself a raise in the process. While this webinar is planned specifically for our in-house virtual tour providers and real estate agents, full-service virtual tour providers are HIGHLY encouraged to attend and share this valuable information with their clients. Get out your notebooks for this information packed webinar! How to Give Yourself a Raise by Using Systems! This FREE webinar is open to the entire RTV network! Now, Go ROCK The Virtual Tour Industry! Dedication and perseverance is our motto here at Real Tour Vision as exemplified by the fact we all made it into work yesterday. ‘Big Deal’ you may think, but I’d like to take a minute and let you know just how big a deal it was for one employee to get here yesterday. Normally on an average day it takes me approximately 8 minutes to get to work, maybe 10 with lights and traffic. Yesterday I pulled out of my driveway to take my kids the 1.76 miles to daycare and I noticed that headed toward town there was a string of bumper to bumper traffic as far as my eyes could see. As I drove along I noticed whole lines of cars parked along the median and even saw two very large construction trucks just stopped in the middle of the road. I ’m not sure if they were trying to give plenty of room between them and others, or if they were stuck spinning their wheels on the ice. It took me a couple extra minutes to get to daycare because the roads were very slick and the car in front of me was going about 20mph. After dropping the kids off I turned around to go into town. A nice motorist in the never ending string of unmoving traffic allowed me to pull out and thus begin my wait. I sat hardly moving in that string of traffic for what seemed like forever! It took me almost 30 minutes before I even passed my house which was only 1.76 miles away! 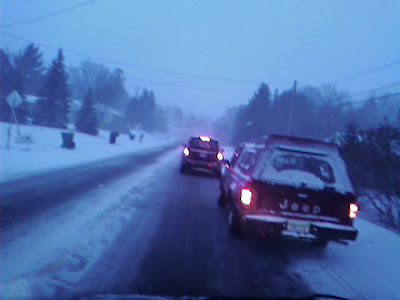 I’ve included a picture I took with my cellphone camera of the traffic during the 30 minutes it took me to drive 2 miles. Altogether it took me over an hour to get to work that morning. One poor employee, who was wearing footwear incompatible with Northern Michigan winters, barely made it into the building without breaking her neck in the parking lot (today she’s wearing boots with traction in case you were worried about her safety). Another employee suffered a very minor fender bender when another motorist was unable to stop and skid through a stop sign into her car. Damage was minor but it shook her up a bit. Then the other driver drove OFF! Let this blog article affirm that we are committed to giving you stellar service and to answer your virtual tour related needs even if we have to risk life and limb to do it! I started my Northeast North Carolina virtual tour company in April of this year and started doing virtual tours in May. I am about to reach my 50th tour this week. This is a great accomplishment in my rural area where the real estate market is really in a slump. Real Tour Vision’s photo stitching software and Rock Point Marketing’s tools are what helps me to sell my tours. My virtual tour business is picking up! I show a sample to a prospective client and before I can finish my pitch and all my information, the 360 home tour is sold. I am gaining a lot of repeat business. My clients are starting to realize that for less than they pay for newspaper ads, they can have their listing on the internet and be seen all over the country. Some have paid up to several hundred dollars just in newspaper ads that run only for a few days. I have one client who was at a Chamber of Commerce meeting raving about my tours. I was told by the Chamber that she was my walking billboard and commercial for Real Tour Vision. With this kind of advertising things can only get better. Also think about this…………the market is in a slump, what better way can the real estate agents be competitive in marketing their listings? I tell my clients that I guarantee my work. The Real Tour Vision software makes it easy for me to tell if I messed up a scene. I have had to re-shoot a scene a couple of times. I let the client know that I don’t like the way the scene looks (white balance might be off a bit) or I tell them the truth, that I hit the zoom by accident while adjusting the camera. Most times I do my outside shots in manual adjustments with a filter or 2 to make the color more vibrant. I now constantly watch my zoom setting and if I think I made a mistake, I delete the entire scene and re-shoot it. Thanks to Real Tour Vision for making my job fun and easy to sell. I love this business!!!! Without boring you with all the “SBA finds that 50% of new businesses fail within the 1st year and the other 45% fail within the next 5…” rhetoric, the fact that you have aligned yourself with RTV is one of the greatest factors to be in the last 5% of businesses that succeed. The other factor is your persistence. How long you persist makes a huge difference in your business. This is the reason to make contact with your clients during the holidays. Set aside some time to do this – it will pay off. Your main focus should be the marketing of your business. First and foremost you are a marketer of what you do and secondly a business owner. Without marketing, you won’t have clients. It will cost you about 5 times more to acquire a new client than it will to make a current client buy a virtual tour from you again. But, you have to deliver the best value for the money you charge them. That is where RTV’s product/support and your personal service make a huge difference. Remind them that you’re there to help them with all their needs and that you want to be their only virtual tour company. With that, a Happy Holidays to all you providers on this globe and huge thank you to Team RTV for all their help and support.